Impassioned crowds chanting for ‘freedom, peace and justice,’ social media posts filling the worldwide web with further calls for enlightened revolution, and a desperate autocrat who has been in power for more than two decades appealing for calm. If all this sounds like large parts of the Middle East and North Africa almost three years ago, it is because protesters in Sudan are desperately hoping for their own version of the Arab Spring. Thousands calling for an end to President Omar al-Bashir’s regime have taken to the streets in the capital, Khartoum, and other major cities and towns in recent days. Huge segments of Sudan’s population of some 30 million people, the majority living below the poverty line, have had enough of putting up with the 69-year-old’s iron fist misrule since 1989. It was in that year that, like so many tyrants before him, Bashir led a group of fellow soldiers in a coup d’état. The seizure of power was relatively bloodless, in sharp contrast to almost everything else which Bashir has been involved in since. Bashir, the first head of state to be indicted by the International Criminal Court (ICC), is already reacting with characteristic brutality, allowing his soldiers to murder civilians with impunity. There is currently a media blackout across much of the African state, but there are reports of scores of lethal shootings and hundreds of arrests. The reason for many joining the anti-government protests was the shooting dead of demonstrator Salah al-Sanhouri. A video circulating on the web shows the 28-year-old standing peacefully before his violent killing last weekend. What is clear is that all of this could have been predicted long before the Arab Spring tipped countries like Syria and Libya into conflict. Bashir’s rule has always been associated with human rights violations and war crimes, and when the southern part of his country won independence in 2011, Sudan proper became an even more oppressive country to live in. The Second Sudanese Civil War, which lasted for a full 21 years until 2005 and in which up to two-and-a-half million people died prompted Bashir’s decision to allow the South independence. Since 2003 he has been prosecuting another war in Darfur, a western region of Sudan, against rebel groups who accused him of trying to exterminate its non-Arab population. The crisis in Darfur has also claimed hundreds of thousands of lives, and displaced around a third of Darfur’s population of six million. Bashir’s brutal suppression of his enemies across the country led to the ICC issuing a summons against him in 2009 for war crimes and crimes against humanity, with a genocide indictment coming a year later. Just like Syrian dictator Bashar al-Assad, Bashir denies any wrongdoing, and has the same close allies in the international community, including Russia, China and Iran. Also just like Assad, Bashir has links with radical Islamist groups including Hamas in the Gaza Strip, and Hezbollah in Lebanon. There have been reports of Sudan smuggling weapons internationally, while terrorist training camps exist in its vast rural areas. A simple glance at any map shows what an attractive place it is for launching attacks against Western targets. What is also certain is that the loss of South Sudan, where around 75 percent of the country’s oil industry is now based, was devastating for Bashir’s regime, and indeed his impoverished people. With the economy in free fall, Bashir was at the end of September forced to remove subsidies on fuel, causing the price of a gallon of diesel to almost double overnight, along with the price of basics like cooking and heating oil. The Sudanese leader has already promised one-off cash handouts to ‘the poorest families’ to offset the fuel increases, but they are doing little to subdue the protesters. Further evidence of Bashir’s government being in denial is that they do not even acknowledge that peaceful pro-democracy supporters are rallying. Soldiers in pick-up trucks with heavy machine guns mounted in the back are now as familiar a sight as closed newspaper and TV bureaus across Sudan. Al-Intibaha, the largest paper in the country, is no longer being published, and the offices of global satellite networks including Al-Arabiya are empty. Senior government ministers have, meanwhile, openly complained about how the ‘media make revolutions’. Further evidence of Bashir’s government being in denial is that they do not even acknowledge that peaceful pro-democracy supporters are rallying. Instead they blame most of the dissent on the Sudan Revolutionary Front, a coalition of Bashir’s traditional enemies. The rest of the ‘troublemakers’, say Bashir’s ministers, are hooligans and vagrants. Such descriptions reflect the default position of dictators who view anybody opposing them as low-life who have no place in civilized society. 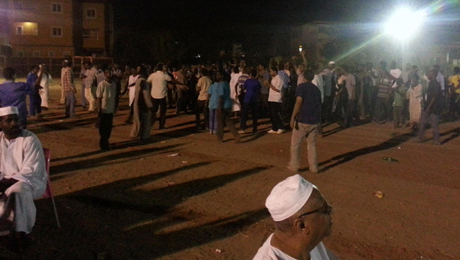 The developments in Sudan are a clear echo of the Arab Spring during its earliest, generally supremely optimistic days. Regimes began to fear the ability of young, literate, ambitious, and technologically savvy populations to get their message across. The dictators panicked, and tried to stigmatize their own people, before imprisoning, torturing and killing them en masse. They also made numerous other disastrous moves including expelling journalists, or even executing them. Sustained efforts were also regularly made to shut down the internet. The difference now, however, is that ordinary people in Sudan will be far more wary of what happens after the initial euphoria of a fledgling pro-democracy rebellion. Getting people out on the street and publicizing demands around the world is crucial to any modern revolution, but it is only the beginning. As we have seen in Syria – and to a lesser extent in Libya and Egypt – savage conflict is an extremely likely outcome of any revolutionary movement. Bashir is an even more sinister figure than tyrants like Assad, and the late Libyan leader, Colonel Qaddafi. Bashir is very well-armed, surrounded by loyal supporters, and long experienced in dealing with all kinds of violent dissent, whether offered by rebel militias or terrorist groups. Even now, he is suppressing any sign of protest with the ruthlessness of a hardened, indicted criminal. Yes, optimistic democrats within Sudan might think that an Arab Spring is dawning, but the struggle to turn it into something genuinely effective is going to be a monumentally difficult one. The vicious media ‘boys club’ trying to shut women up is as prevalent in Britain as it is in France. 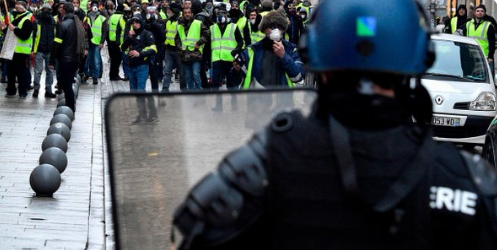 Gilets jaunes infighting shows the movement is brutally disunited – but Macron is still no match for them.